This widget provides CEST analysis using the Fabber Bayesian model fitting framework. You can type in your frequencies manually - the list will automatically grow as you add numbers. However, you may have your frequencies listed in an existing text file - for example the dataspec file if you have been using Fabber for your analysis. To use this, either drag the file onto the list or click the Load button and select the file. Quantiphyse will assume the file contains ASCII numeric data in list or matrix form and will display the data found. 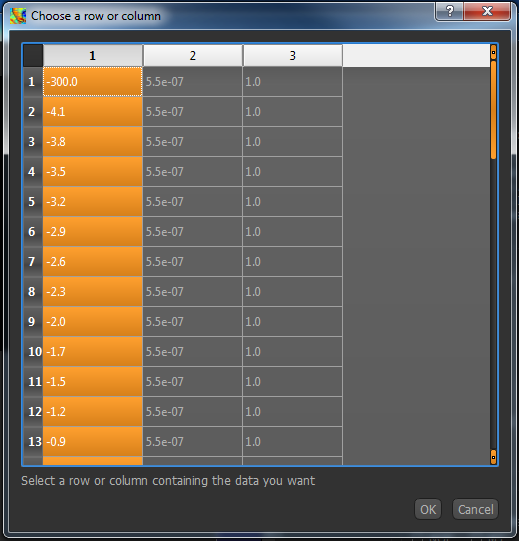 Click on the column or row headers to select the column/row your frequencies are listed in. In this case, we have a Fabber dataspec file and the frequencies are in the first column, so I have selected the first column of numbers. Click OK to enter this into your frequency list. Note that you are being warned that the default pool data will not be correct for a custom field strength and you will need to edit them. The saturation field strength is set using the B1 (µT) spin box below. Select Pulsed Saturation from the menu. The pulse magnitudes and durations can be set in the same way as the sampling frequencies, so if you have them in a text file (for example a Fabber ptrain file), drag it onto the list and choose the appropriate row/column. The number of magnitudes must match the number of durations! Repeats can be set in the spin box at the bottom. Six built-in pools are provided, with data at 3T and 9.4T, you can choose which to include using the checkboxes. To view or change these values, click the Edit button. If you want to use a pool which is not built-in, you can use the New Pool button to add it. 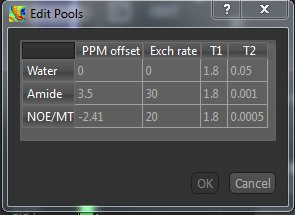 You will need to provide the four parameters above, and your new pool will then be selected by default. T1 map/T2 map - If inferring T1/T2, an alternative to using the pool-specified values as priors you may provide existing T1/T2 maps for the water pool. 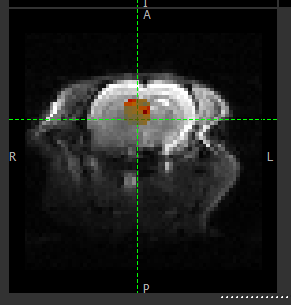 Spatial regularization prevents Fabber from processing voxels in parallel, hence the analysis will be much slower on multi-core systems. This will perform the model fitting process. mean_ppm_off - Model-inferred correction to the ppm values in the z-spectrum. 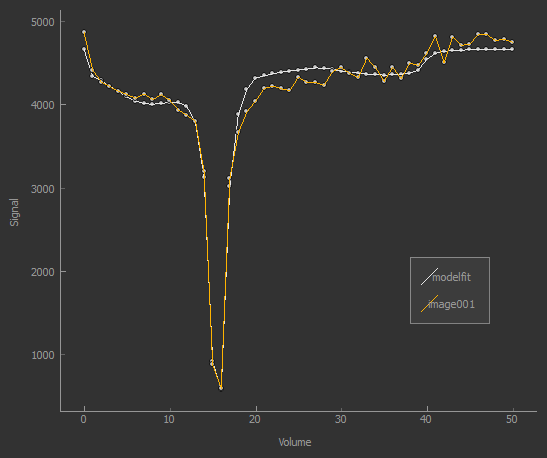 The screenshot below (from the Voxel Analysis widget) shows the model fitting to the z-spectrum. This is a quicker alternative to model-based analysis, however less information is returned. The output of the LDA calculation is provided as a multi-volume overlay lorenz_diff.